Options to upgrade: If medically appropriate and with Doctor approval/prescription, patients may add the following to their HCG Diet Program to help optimize results at additional cost: Phentermine- helps suppress appetite and increase energy levels while dieting Nutrient IV Therapy- An IV which contains vitamins to help support the body during dieting and provide additional nutrients and B vitamins as well as to help increase energy levels. Note: HCG Specials may not include all of the above-listed services due to the discounted rate. The above describes the Full HCG Program at the full cost. During the 1950s, Dr. A.T.W. Simeons, an endocrinologist, discovered that low doses of HCG in obese patients allowed their body to mobilize and use “abnormal fat” stores as a source of energy, thus leading to considerable weight loss. He also found that HCG in pregnant women served as a protective mechanism for the fetus should the mother not consume an adequate amount of calories. Capitalizing on this knowledge, he found that combining HCG with a very low-calorie diet (VLCD) produced dramatic weight loss at the rate of 1 to 3 pounds per day. It is speculated that In a person who is not taking HCG, this same VLCD would put the body in starvation mode and the opposite would occur–fat would be stored rather than being mobilized for energy. Dr. Simeons also speculated that HCG resets the body’s “thermostat,” the hypothalamus, which is the body’s control station for metabolic rate, hunger, thirst, and body temperature which also contributes to the dramatic weight loss seen with the HCG diet. How does HCG theoretically work? One pound of fat is equal to 3,500 calories. Jogging for 1-mile burns about 100 calories. If you’re 50 pounds overweight, you need to jog from San Francisco to Dallas (1,750 miles) to burn 50 pounds (mathematically that is, without taking different metabolism speeds into consideration). However, if it were that simple to lose weight then many more Americans would be jogging from coast to coast. Many Americans work out regularly and burn the calories but can’t seem to lose the weight. The reason why? They are burning the wrong calories. If a person’s normal metabolism requires 2000 calories per day, and that person is consuming only 500 calories per day on the HCG diet, then the remaining 1500 calories will come from “abnormal fat” stores (i.e. the stomach, hips, thighs, buttocks, back, underarms). These abnormal fat stores are often the stubborn areas that don’t seem to diminish with regular dieting. Normal Fat: the fat that the body uses for energy when calorie intake is less than bodily demands. Abnormal fat: excessive and abnormal accumulations of fixed deposits of fat located throughout the body and associated with obesity. During nutritional emergencies (i.e. not having an adequate amount of calories) the body is unable to use this fat for energy. When exercising or restricting food intake, the body relies on and consumes the normal fat reserves. 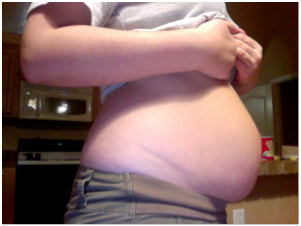 The body cannot access the abnormal fat accumulations. Dr. Simeon speculated that the use of the HCG hormone releases abnormal fat deposits and makes the fat available for consumption by the body. 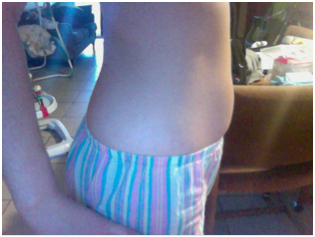 Dr. Williamson lost 65 lbs after pregnancy and used the HCG diet to do it within 5 months. 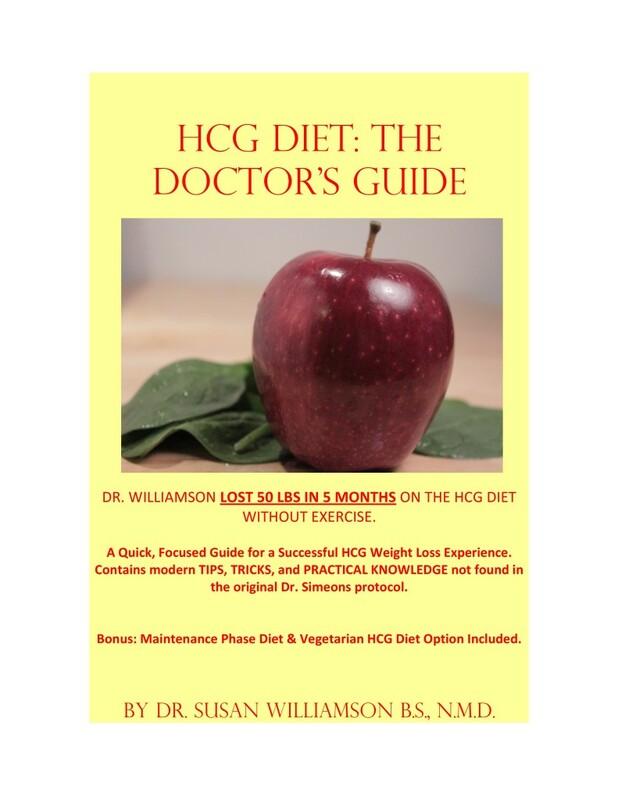 Dr. Susan Williamson (Weirick) is the author of HCG Diet: The Doctor’s Guide. *Individual results may vary. Weight loss depends on many factors such as metabolic rate, activity level, adherance to a diet, and exercise. It is recommended to undergo laboratory testing and a medical evaluation to determine if your metabolism and hormones are balanced prior to starting a weight loss program, and to determine if you are healthy enough for a weight loss program. FDA Disclaimer: HCG is not FDA approved for weight loss. There is no substantial evidence that it increases weight loss beyond that resulting from caloric restriction, that it causes a more attractive or “normal” distribution of fat, or that it decreases the hunger and discomfort associated with calorie-restricted diets.